Previous studies have reported that adding cognitive restructuring (CR) to exposure therapy does not enhance treatment gains in posttraumatic stress disorder (PTSD). This study investigated the extent to which CR would augment treatment response when provided with exposure therapy. The authors randomly allocated 118 civilian trauma survivors with PTSD to receive 8 individually administered sessions of either (a) imaginal exposure (IE), (b) in vivo exposure (IVE), (c) IE combined with IVE (IE/IVE), or (d) IE/IVE combined with CR (IE/IVE/CR). There were fewer patients with PTSD in the IE/IVE/CR (31%) condition than the IE (75%), IVE (69%), and IE/IVE (63%) conditions at a 6-month follow-up assessment. The IE/IVE/CR condition resulted in larger effect sizes than each of the other conditions in terms of PTSD and depressive symptoms. 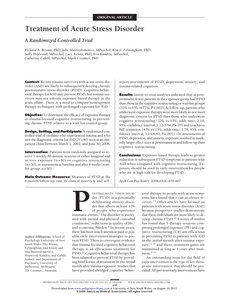 These findings suggest that optimal treatment outcome may be achieved by combining CR with exposure therapy in treating PTSD patients.